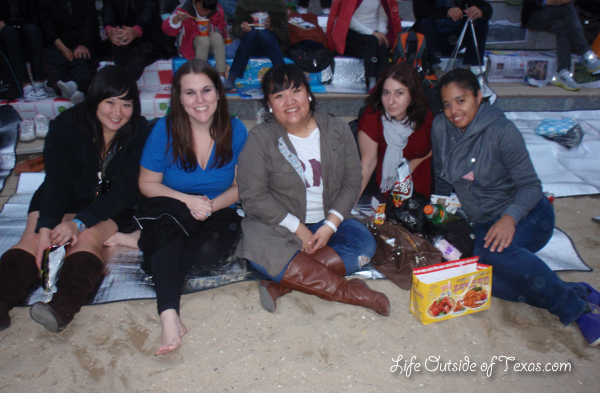 My first experience at the Busan Fireworks festival was back in 2011. I remember thinking we had really lucked out with the weather. The temperature was nice during the day and even though it was cloudy, it wasn’t raining. I must have been feeling really optimistic when I left my apartment because I didn’t even bring an umbrella. The rain held off most of the day, but we were all pretty disappointed that the showers came right before the fireworks were meant to start. 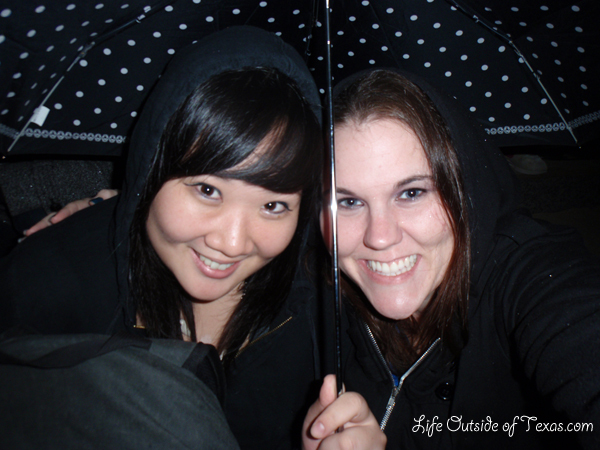 My friend Jamie was kind enough to share her umbrella with me, but it didn’t stop us from getting very, very wet that night! 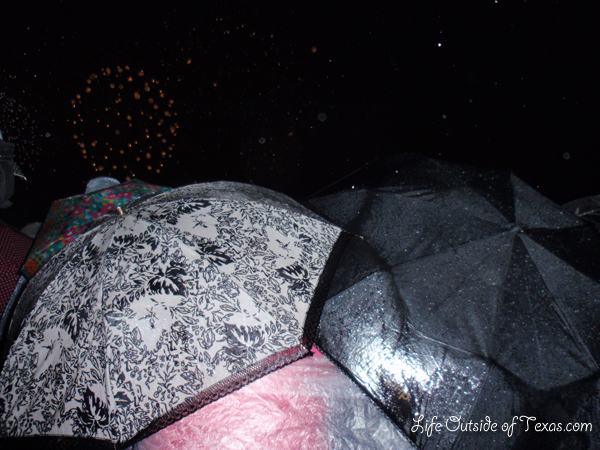 When the fireworks finally started, they were beautiful. 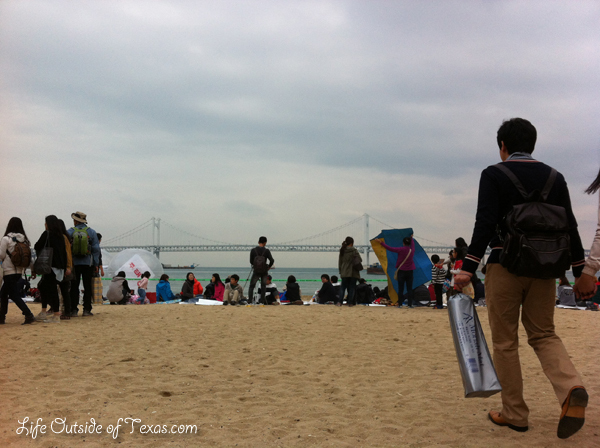 BUT lots of people on the beach were holding umbrellas so our view was obstructed. And as the rain got heavier, our view got worse and worse. And we got colder and colder! I was so glad to be able to go back this year and make better memories! 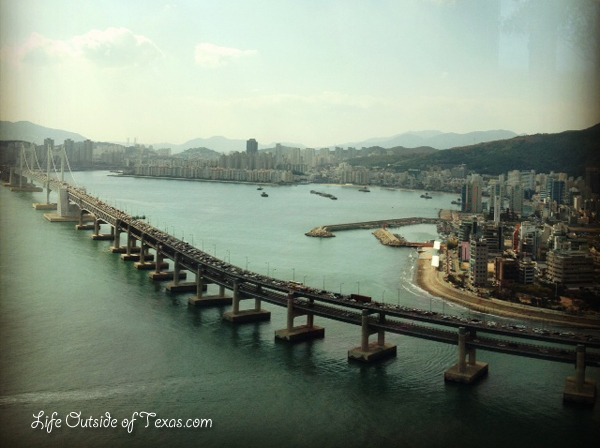 Since we don’t live in Busan, the first thing we did was book a hotel room (this must be done many months in advance — we already booked for 2014!) at the new Park Hyatt Busan. We hoped for a room with a view of the bridge, but they were all booked. Unless you’re able to get an ocean view room at the Hyatt, it’s probably not the best place to watch the fireworks. They book out all of the seats at the lobby lounge and in the restaurants in advance and without a reservation, it’s pretty impossible to watch from inside the hotel. The best place to view the fireworks is from the beach. If you want to watch from the beach, you’ll have to get there in the afternoon and camp out. The beach fills up and will get really cramped. Since this was my second time at the festival and I’d already done the beach thing, Dave and I decided to stay close to the hotel. 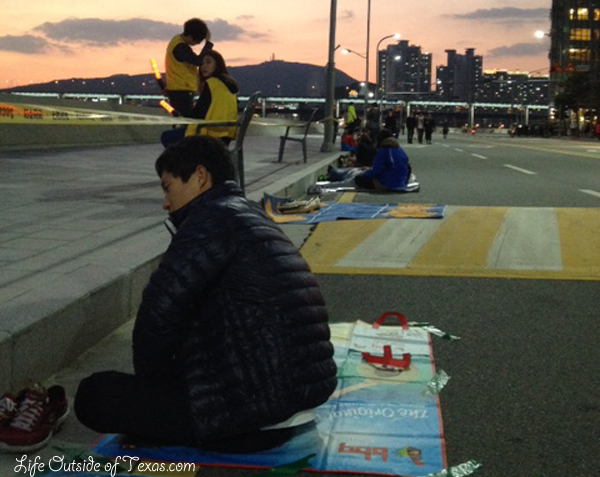 We walked a few blocks from the hotel and camped out just behind the yellow tape. 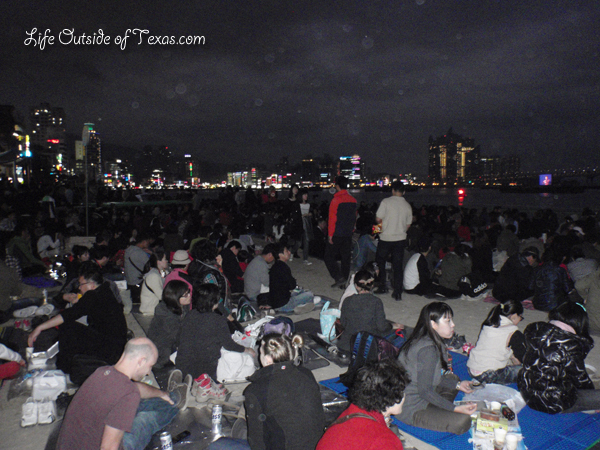 The area around the Hyatt will put you looking at the back of the Gwangan Bridge so you won’t get as great of a view as those on the beach, but the show is still amazing and you are only slightly crowded rather than feeling like you’re in a clown car. Here are some of our favorite photos of the 50-minute fireworks display. Please feel free to click on the photos in the gallery below to get a better look. 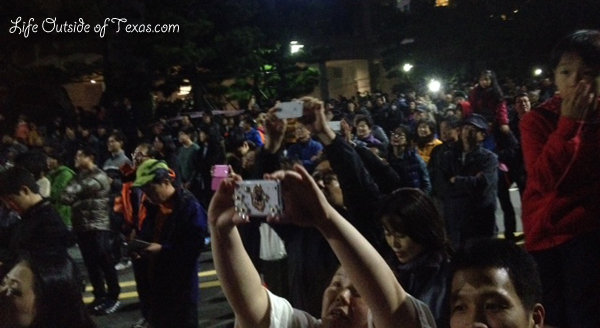 Wherever you decide to watch the fireworks, it’s important to realize that the entire Gwangalli Beach area will be chaotic. The subways will be cramped and the streets will be packed. It’s going to take a while to get anywhere, but it’s a great show and I highly recommend braving the crowds to see it. 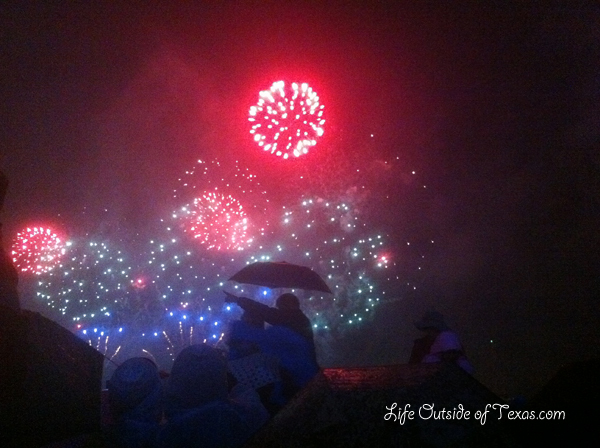 The Busan Fireworks Festival is an annual event. It takes place during the last weekend of October. We believe next year’s festival will take place on October 25, 2014. You can find more information here. This entry was posted in Autumn, Busan, Festivals in Korea, Places to See in Korea and tagged busan festival, Busan Fireworks Festival 2013, busan tourism, festival of fireworks, festivals of korea, firework photography, gwang-an bridge, korea festival, photography, places to see in busan, places to visit in korea, tourist attractions in south korea, travel, visit busan by Meagan & Dave | HappilyEverExpat.com. Bookmark the permalink. I love your fireworks pictures, especially the last one of the finale, I’m guessing? I would totally camp out to see that. Fireworks are the best! Thanks! My boyfriend took all of the photos this year. He’s more of a night/long exposure photography expert than I am. We love a good fireworks show too and this did not disappoint. It’s actually pretty full on for the entire 50 minutes. I heard this year was bigger than ever because it was the city’s 50th anniversary. all picture of the fireworks are very intresting …. Its also reminds me my old memories..as i was also enjoying the fireworks with heavy rain while sitting infront of beach and just closed to water in 2011. I don’t think anyone there in 2011 could forget it! So cold and so wet. It was definitely an experience to remember! Enjoyable post! So without taking the time to do research, the festival is strictly about fireworks? Is there a significance behind it or a reason? (I’m afraid I don’t have much free time to look into this). Looks like a blast! Yes, this festival is all about the fireworks. There’s also an international movie festival in Korea (BIFF) in Korea that ends around the same time. The main fireworks festival is on Saturday night and there’s usually a Korean Pop concert on the Friday night. It’s a lot of fun. Hi there! I chanced upon your blog while doing some research. Really great photos! I’m looking for a good spot to go this year. May I know around what time were you there? Near the hyatt. I see you had a good spot! I can’t remember exactly. I think we got down there around 5pm or so and we just sat down and waited. For a while we had lots of room, but eventually it got pretty crowded. We enjoyed watching from behind the bridge, because it isn’t as chaotic. The fireworks were good enough. They are a bit better from the beach, but you need to get there pretty early to ensure you get a good spot and it gets VERY crowded. Hey I found your post quite amazing. I am going to attend BIFF this Saturday, as I am staying in Geoje (a city near Busan) I will be returning back same night by bus. Now the catch is the last Bus from Sasang bus terminal is at 11 PM. As I read on its website fireworks last till 9.20 PM. I am wondering if I would be able to catch the bus if I start from Gwangwalli beach at say 9.30 PM. From beach to Gwangwan subway station to Sasang subway station (50 mins ride). Bus terminal is 5 mins from sasang subway station. Given the crowd and rush what is your opinion? It’s been 3 years since I’ve tried to maneuver the subway after the fireworks festival so my memory is a little hazy, but I do remember how manic it was. I’m not sure what time the fireworks end, but the crowds are enormous. 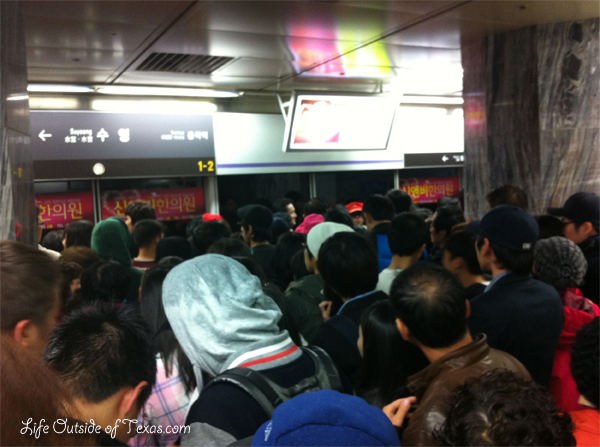 Just getting to the subway was chaotic and then you have to wait for a train. Be sure to give yourself plenty of time and you may want to leave a little early to beat the crowds. Sorry I couldn’t be more help!